If it's your first time getting clothes made or altered or whether you've had an array of apparel created and fitted specifically for you, we all know it's sometimes nerve-wracking when you have to speak to your tailor. 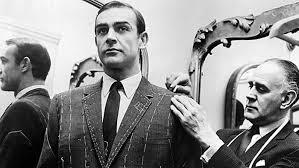 Your tailor will know what you want if you describe what you're looking for even if you're vernacular isn't on point. Make sure you at least have an idea of what you want and let your tailor take it from there. Wear the best fitting suit or sport coat that you like (the style or the fit that you'd like to duplicate or improve upon), read over some terminology, research the difference between certain clothing and definitely bring in some pictures if you see something you really like. - If you're not sure about something make sure to speak your mind and make sure everything is clear for you. Your tailor is not a mind reader and asking questions to clarify any confusion can eliminate the potential for miscommunication. 4) Be open and honest. - Just because it's recommended or your tailor likes it doesn't mean that you must like it or want it. On the flip side, be open minded to their recommendations because they know what is in style and fashionable today. They are there to serve you and your wants and if you're not honest, you might end up walking out with something you won’t want to wear!